The Lightning Saga - Part Three: "Suicide"
At the Hall of Justice Batman continues with his discussion/interrogation of Karate Kid and the other members of the Legion of Super-Heroes. In the Congo Hal Jordan, Jay Garrick, Vixen and the new Wildcat are greeted by Solovar and welcomed into Gorilla City. After watching a "chariot" race Green Lantern uses his ring to snap Timber Wolf (the Legion member they had tracked to Gorilla City) out of his trance with the code word "Lightning Lad". Timber Wolf immediately wants to join the rest of his team. Meanwhile Hawkgirl, Hawkman, Red Arrow and Power Girl travel to the planet Thanagar to find another lost member of the Legion. Red Arrow and Hawkgirl continue their flirtations but Power Girl is quick to advise Arrow against pursuing such a romance considering the complicated relationship between Hawkman and Hawkgirl. In the Metropolis of the future the Ultra Humanite, Despero and Per Degaton of different era meet and discuss their plans. In the present on Thanagar the group finds the Legion ring but not Dawnstar, who had given the ring to a woman who cared for the Legionnaire very much. The woman reveals that Dawnstar has already left. Back at the Hall of Justice Timber Wolf arrives with Dawnstar right behind him. Wildfire hits her with the code word and suddenly she remembers why they had come. Story - 5: You know, sometimes it is the little things that get me. Even when I am enjoying the heck out of a story that has all kinds of cool, summer blockbuster moments going on it will be a small little scene that makes a story for me. This issue had a great mix of old school JLA/JSA working together bits and revelations that serve to drive the story along. The scenes in Gorilla City and Thanagar were great scenes because they further expanded the scope of the series. Meltzer and Johns are both great at reminding us of all the neat corners of the DCU, so this comes as no surprise but is welcome nonetheless. Meltzer also gave us some cool moments of characters that normally don't get to "hang out" all that much mixing it up and having some fun. I liked seeing Jay Garrick and Vixen running together. These moments are one of the many reasons I like these crossovers so much. The revelation of who the villains are put a big ol' fanboy smile on my face. If you are going to have a time travel story then Per Degaton has to be involved. Yeah, the Silver Age Despero was keen and anytime Ultra Humanite gets screen time is ok by me, but Per Degaton is THE villain for stories that involve time travel and different eras. The only problem is that is Degaton is involved there is the very big chance that at the end of this story none of what transpires will have actually occurred. It's happened before, especially in the pages of ALL-STAR SQUADRON, so I'm kind of nervous but happy at the same time. But again it's the small things that get me sometimes. Even after the reveal that the Legionnaires are on a suicide run the scene that stuck in my mind the most was the conversation between Power Girl and Red Arrow on the ship. There are some readers that seem to believe that Meltzer doesn't put enough characterization into his writing. This is the scene that, to me, proves them wrong. After a quick and amusing bit with Red Arrow and Hawkgirl having some very MOONLIGHTING style dialogue Meltzer gives us a conversation between Arrow and Power Girl that was entertaining and kind of sweet at the same time. Meltzer has been playing with the attraction between Hawkgirl and Red Arrow for a few issues and while it is somewhat soap opera it's one of those sub-plots that I like to see in a team book. Power Girl tries to impart some sage like advice concerning his attraction to one of the Hawks and the dialogue just stuck with me. I can't really explain it. It's just one of those things. I liked it and thought that it had a great balance of continuity and character. Aside from that this was a very solid chapter to "The Lightning Saga" and the momentum from the last two chapters kept on going. There are some mysteries brewing and I look forward to more reveals. I mentioned in the review for the last review that I would probably like this storyline even if it was terrible. Luckily this is not the case. Art - 4: It was interesting to see Ed Benes working solo on the art for this issue. He was given a lot to work with and as usual he delivered. The race in Gorilla City, the scene on Thanagar, the Hall of Justice and even the future Metropolis were all featured and they all looked solid. I also dug his versions of Per Degaton, the monkey Ultra Humanite and Despero, especially Per Degaton, who was a bit tall but why pick nids? This was a great issue art wise. I'm not so sure I like Benes inking himself but at the end of the day I liked what I saw. Cover Art - 4: (Standard Cover by Michael Turner and Peter Steigerwald) This was a nice cover but a bit on the boring side. I am growing somewhat weary of covers where characters are just kind of standing around. 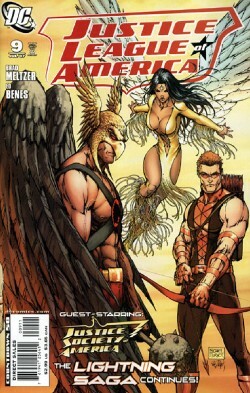 Hawkman, Red Arrow and Dawnstar look good but it is a very static cover with very little life to it. Cover Art Alternate - 4: (Alternate Cover by Phil Jimenez and Rod Reis) On the flip side there is almost too much going on with this cover. But despite the crowded feel to the cover I liked it just the same. 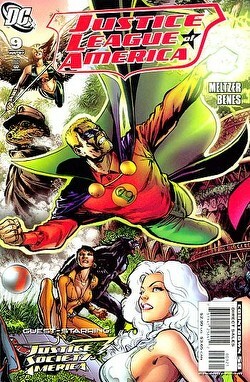 I'm rather fond of the Alan Scott Green Lantern, so I was pretty much predestined to like this particular cover. Again it was a bit crowded but it was still the cover I preferred.